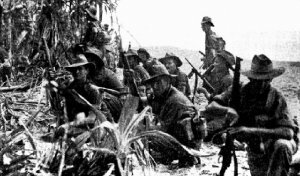 In the campaign for the advance along the Rai Coast from bases on the Huon Peninsula, New Guinea, the Japanese rearguards had sawed through the wooden bridges, delaying the Australian advance every so often. The crossings had to be made by breaching the bank of the waterway down to provide a ramp to ford, or fix the flimsy scaffold structure. As the numerous creeks constituted temporary armoured tracked vehicle obstacles, the infantry led the advance, followed by engineers with a bulldozer for the construction of tank crossings. When opposition was met the infantry engaged with mortars and artillery support, waited for the tanks to come forward and an infantry assault supported by the tanks was invariably decisive. When the Matildas were held up on one occasion the enemy were probing the forward platoon across the creek and under urgency the tanks were able to cross a newly built bridge and blitzed the aggressive Japanese infantrymen whom then promptly withdrew. Throughout this campaign the rain would have made it impossible to use tanks on the wretched tracks across the coast and through the Song Valley. But first the enemy had to be cleared from Pino Hill for the arduous advance on Gusika. The 2/23Btn was ordered to capture this feature and the plan for the striking force was Capt Lancaster’s company on the right would capture Pino Hill itself with Capt Davidson’s company on the left would occupy the jungle fringe. And four Matilda II’s, under Lieut Watson of the 1Army Tank Battalion, would be assisting both. In the meantime the other two companies of the 2/23Btn were being hard pressed by an opportunist Japanese counter-attack to push the Australians back over the Song River with the I & II battalions, 79 Regiment. The artillery of 2/12FldRgt rapidly ringed Pabu with shells and broke up the attack and even the well dug in position of Captain Keley’s company, resorting to hand to hand combat, repulsed repeated Japanese rushes. The seizure of jungle clad Pino Hill opened at 8.30am on the 28 November 1943 with the tanks in pairs approaching with the freedom of movement through the kunai covered steep slope with the advancing infantry hidden in the long grass giving close protection. Within half an hour the high ground at Pino Hill was cleared, as the Japanese had abandoned this extremely defensive high ground before the arrival of the tanks. And four snipers and one giant python were destroyed by an American rocket machine (bazooka) then two machine-gun posts were knocked out by the marauding Matildas in a diversionary attack to assist the advance of the 2/43Btn over Pino Hill. The 2/28Btn with another troop of tanks combined along the muddy coastal track on the right flank and the shoreline was made safe through the surprise capture of Gusika. The next day a troop of tanks in support of Capt Hannah’s company continued the advance with a bulldozer improving the jeep road through the flat coastal marsh strip mangrove covered dense jungle. The drive north-westward along the scenic coast by the AMF 4Bde, 5Division, was assisted by two troops of Matildas, a platoon of native Papuan Infantry Battalion which provided advance reconnaissance, uncanny bushcraft and an instinct for ferreting out the enemy. Full divisional artillery support was in the initial order of battle engineer detachments and the provision of Allied navy vessels. An advance of leaps and bounds, to and from one beach maintenance area to another covered by the airforces. 22Btn crossed the Kalveng River beyond Gusika in early-December to obtain a bridgehead so as to breach the steep-sided embankment and permit construction of a vehicle crossing. Strong enemy defences embodied solid bunkers protected by a minefield were located beyond the Diggers forward pickets. After much groundwork the assault began two days later with the Matildas moving at the rear of the leading company from the 29/46Btn, the tanks were to be called forward when strong opposition was met, with one platoon of sappers and a bulldozer. At the edge of the first minefield the tanks were delayed and unable to proceed but by directing heavy fire at the bunkers assisted the breakthrough. The diabolical Japanese had produced an effective delaying device in tank-mines of picric acid buried deep in the ground and boosted with large prepared charges. A new tank track had to be cut and bulldozed launching a succession of encircling and bypassing attacks forcing the enemy to withdraw from one position after another and resisted strongly mainly at creek crossings of the coastal jungle. The Matildas again demonstrated their value at Lakona where the surrounded Japanese on Cape Sibida had resisted desperately for days and caused heavy casualties on the three companies of the 22Btn. Held up by a creek crossing five Matildas arrived late in the evening and immediately attacked with one infantry company and within the hour the entire emancipated suicidal enemy was wiped out. In the wet weather the whole route as far back as Katika became impassable to mechanised vehicles and native carriers could only be spared for so long. In one of the last battles while it advanced up the coast the 1Army Tank Battalion was involved in a fight against Fortification Point assisting the AMF 29/46 and 37/52Btn’s of 4 Bde. The tanks and infantry, supported by artillery, had broken enemy resistance in the Masawang River region and with air and sea bombardment the Australians had occupied the high ground at Fortification Point. Here the assisting Matildas became bogged and were disabled, unable to replenish the ammunition and Capt Richard’s reserve company, from the 2/24Btn, in a fierce firefight with the Japanese covered the Matildas from being destroyed. On the way westward to Sio in late December the jeep road eventually reached Hubika and the engineers found the gorge just beyond would prevent any progress by the Matildas, now commanded by Capt Hardcastle. There was no alternative route and the outlook for tank support was grim, as the sappers estimated the work would take several days. The enemy was now in full retreat although the rearguards, on occasions at certain points, continued to fight stubbornly. The AIF 20Bde, of 9 Division, that had been following the advance as reserve now prepared to move forward and take up the what now became a rapid pursuit with 2/13Btn moving out from under artillery range. With the increase of air power the infantry moved on, US Marauders, Kittyhawks, Thunderbolts, Airacobras, RAAF Wirraways, Venturas and Boomerangs fighting aircraft of the Allies filled the skies. The Allied supply line of rations, ammunition and medical supplies were brought forward by barge with engineers maintaining the jeep track to the leading infantry on the coast and the inland columns were supplied by native carriers and pack horse or mule train. The shortage of transport necessitated the maintenance of numerous small medical posts that kept pace with the advance rather then establishing a larger more static clearing station. Under Brig-General Martin, from General Krueger’s Sixth American Army, the US Army 126IR combat group veterans of Buna and Gona a year ago, were to amphibiously land further up the Rai Coast at Saidor in early-January 1944. To block the coastal track between Sio and Bogadjim, south of Madang, and increase even more the enemy’s supply difficulties and retreat route. Along the coast the enemy abandoned guns and dumps of equipment, ammunition, medical stores and engineer stockpiles with smashed barges and other watercraft littering the beaches. The telling evidence of effective blows by patrol torpedo boats, motor launches and Dutch & RAN corvettes plus increasing allied air superiority. The enemy’s loses in this campaign were heavy for as the Australians approached Sio an increasing number of Japanese dead were found along the track, the sick and wounded were unable to keep pace with the withdraw and had been abandoned to their fate. These Australian expeditions demonstrated that a tank force could go through some of the most difficult jungle with the help of a bulldozer, the skill of the tank crew and the sweaty labour of infantry down the improvised log corduroyed road supported by these AFV’s. The tanks also had wireless communications and were frequently used because of the Japanese cutting telephone lines. The 1Army Tank Battalion operations ended with the return to Australia, February 1944. 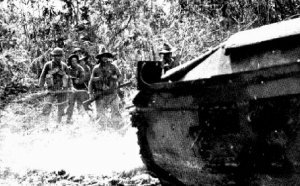 Another armoured unit the 2/4AR consisting of three squadrons of Matildas took its place in the operations across the northern coast of New Guinea from Aitape to Wewak and during January 1945 portions of that regiment transferred to Bougainville till the end of the war.